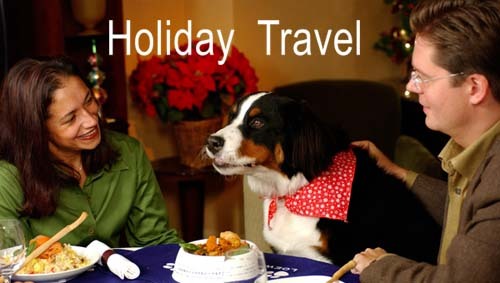 Ruff holidays? Here's a way to lick 'em. So you've finally found someone to feed Freddie and walk Waldo when you make the annual trek back home this holiday. 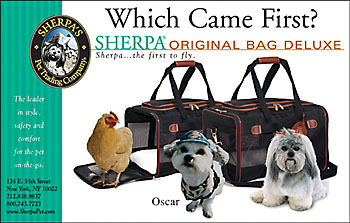 Suddenly, your Designated Pet Sitter wins a ski trip to Aspen, taking her parka--and your pet-sitting plans--with her. Are you stuck? Maybe not. The number of people who travel with pet-in-tow has been steadily rising over the past few years. A 2001 survey revealed that 65 percent of pet owners traveled with their pets, according to the American Animal Hospital Association, up seven percent from 1995. As a result, transit systems and places of lodging are beginning to adapt to the presence of non-human guests. The trend has already given birth to websites like http://www.petsonthego.com, a cornucopia clearing house for pets and pet owners on the move. Loews Hotels (http://www.loewshotels.com) owner of New York's Regency Hotel on Park Avenue, unfurled the "Pet's Welcome" mat over two years ago with its "Loews Loves Pets" program. Each guest pet receives a welcome note from the hotel manager with a list of nearby veterinarians, pet shops, groomers, pet-friendly restaurants and other necessities. The guest room itself is prepared with things like food bowls and mats, and things like pet beds, leashes and kitty litter boxes are available for borrowing. Prices range from $109-299 per night, depending on hotel. Pet walking and pet sitting can be procured through the concierge, and a special "Puppy Pager" lets the hotel contact owners in case of emergency. The newest addition to the "Loews Loves Pets" program is their "Houndly Holidays" package, available at all 18 Loews Hotels throughout the U.S. and Canada. Canine and feline guests have their choice of holiday dinners like Dog Nog, Turkey Rolls a la Pug, Spaniel Stuffing and Persian Pumpkin Pie. The hotel's standard pet fare includes bow wow burgers, chicken and rice and tuna delight. And, for the month of February, Loews will be offering a special "Puppy Love" package. The Puppy Love package offers a special rate for a one-night stay, a free in-room movie and dinner for two in the hotel restaurant and special "Poodlicious Peanut Butter Cookies" for the significant other who's a real animal. Prices for both the Houndly Holidays and Puppy Love packages range from $176 at the Loew's Annapolis to $509 at the Regency. Preheat oven to 375 degrees. In a bowl, combine flour, oatmeal, and baking powder. In another bowl, mix peanut butter and milk. Add wet mixture to dry and mix well. Turn out dough on a lightly floured surface and knead. Roll dough _ inch think and cut out in desired shape, (hearts). Place on greased making sheet. Bake 20 minutes or until lightly brown. Cool on a rack and store in an airtight container. Please Note: The above treat is not intended for daily consumption. Additionally, this treat should not be fed to pets with special dietary restrictions.